Stevia has become very popular these days as a natural sweetener substitute for sugar and artificial sweeteners. There are lots of ways to use stevia as sweetener, and one of the most popular ways is using liquid stevia extracts. If you love stevia sweeteners, I have great news for you! 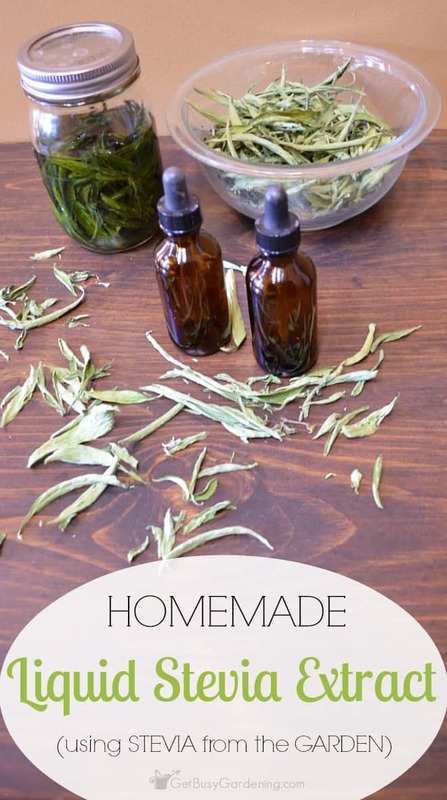 You can easily make your own homemade liquid stevia extract – and you can even use the stevia you grew in your garden. Every time I post a photo of my stevia plant on social media, I get tons of questions about it. Most people want to know how they can use the stuff they grew as a sweetener. But many people are actually shocked that stevia comes from a plant. People are so used to seeing stevia in a white powder form, they’re shocked to see it’s actually a real life green plant. Wait, what? Stevia comes from a plant? Yes! Believe it or not, stevia is an herb plant that you can easily grow in your garden. Since stevia has become so popular, it’s pretty easy to find stevia plants for sale in garden centers these days (for all you local peeps, I bought my plant at Bachman’s). Stevia can also be grown from seed, so look for stevia plant seeds for sale while you’re out shopping too. 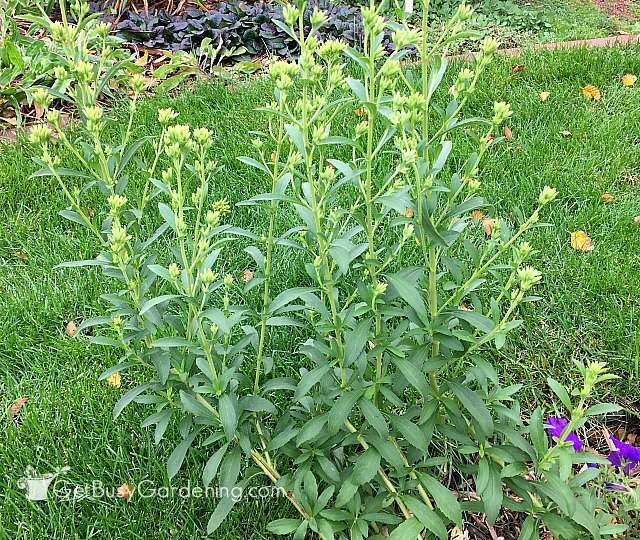 The best time to harvest stevia plants is once they start to grow flowers. Stevia can be harvested just like you would harvest basil – by picking the leaves from the plant. 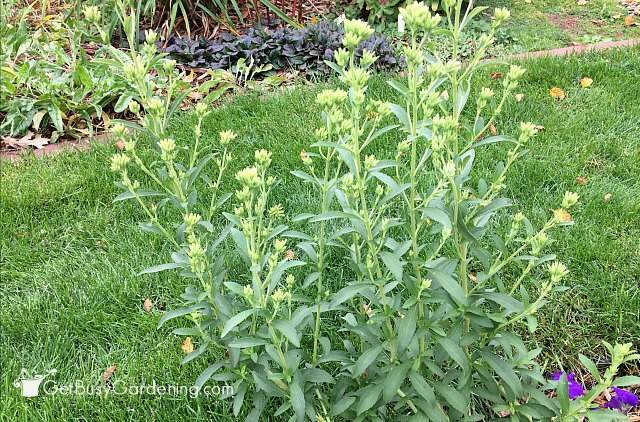 You can harvest stevia leaves as you need them throughout the summer, then harvest the whole plant once it starts to bloom or in late summer or fall (be sure to harvest your stevia before frost). 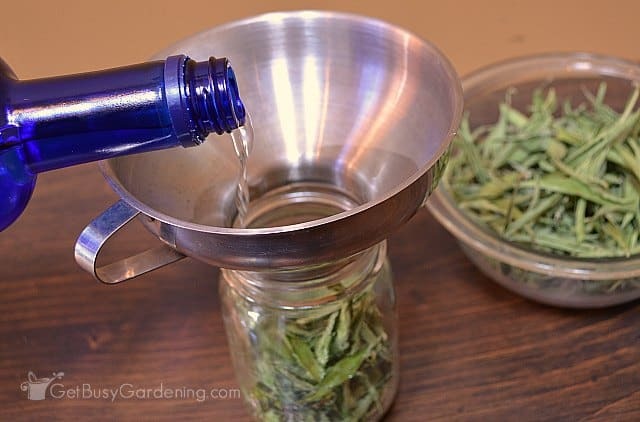 You can use stevia leaves fresh from the garden to make your stevia extract, or you can dry the leaves first. 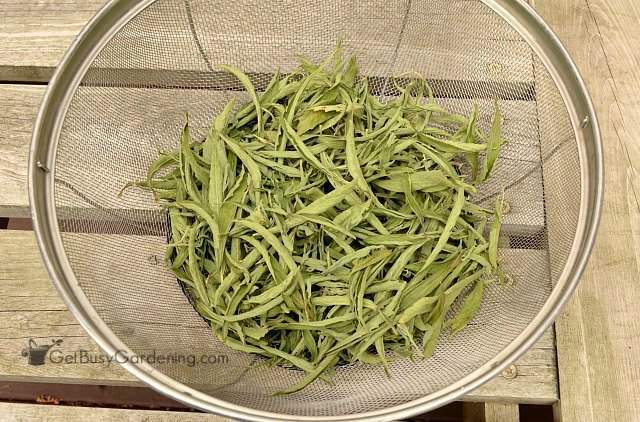 You don’t need any fancy equipment to dry stevia leaves, and they dry really fast. Simply lay them out on an herb drying rack, or tie the stems together and hang them upside down until they are dry. Of course, you could always use a food dehydrator if you want to speed things up, but you don’t need to. Once the plants are dry, strip the leaves from the stem, and toss the stems into the compost bin. Don’t try to use the stems to make stevia extract, because they aren’t sweet like the leaves, they are much more bitter (Yuck!). *I recommend using a high quality vodka because it has no flavor. 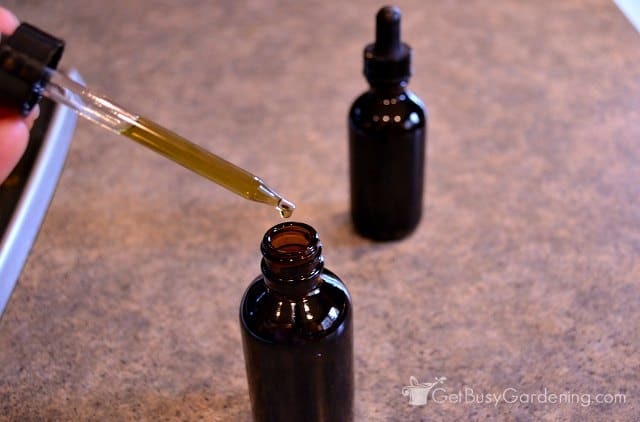 You could experiment with other types of alcohol if you want (like rum or gin for example), but I’m not sure how it would affect the flavor of your extract. 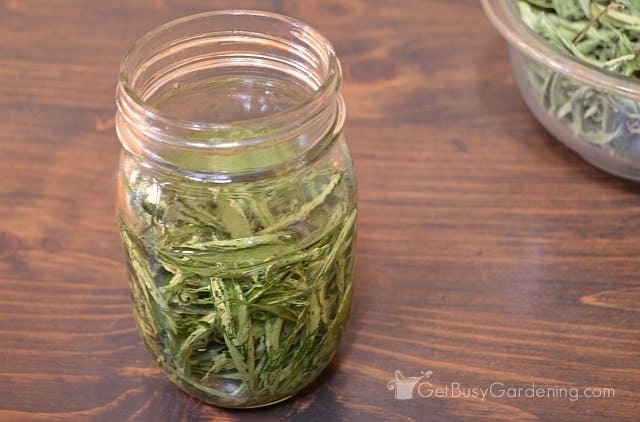 Step 1: Loosely pack whole stevia leaves into the jar. 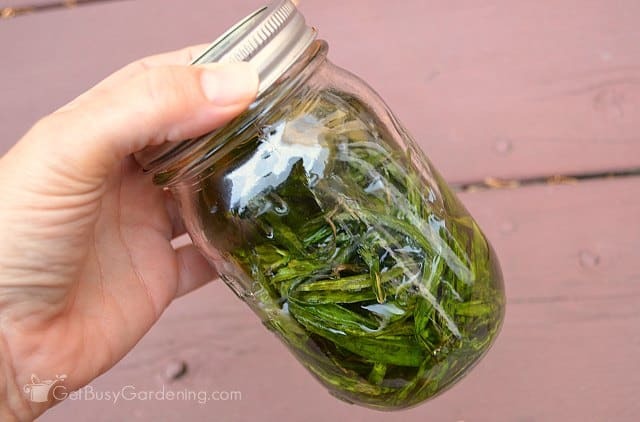 You don’t need to crush the leaves or jam them into the jar, just loosely pack them in. Step 2: Pour the alcohol into the jar, using enough to cover the stevia leaves. You can add a little bit of alcohol at a time, and gently tap the jar on the counter between pours. That will help the leaves settle and get rid of air bubbles, which will help you to gauge how much more alcohol you need to add to the jar. Step 3: Once you’ve added enough alcohol to cover the leaves, simply cover the jar with a lid and let is sit for 24-48 hours. Don’t let it sit longer than 48 hours, or the stevia extract will start to go from sweet to bitter. If you think about it, shake the jar every once and a while to help release even more of the sweetness of the stevia leaves into the alcohol. Step 4: Strain the leaves out of the alcohol. At this point you have a nicely sweetened infused vodka. You can leave it as is (though technically you won’t have stevia extract) and use it to sweeten summer cocktails (like mojitos or hard lemonade), or you can continue on with the next steps to turn it into stevia extract. Step 5: Pour your stevia infused vodka into a small pan. Step 6: Simmer the liquid over low heat for 20-30 minutes to remove the alcohol. Do not bring the liquid to a boil, or it could remove the sweetness. 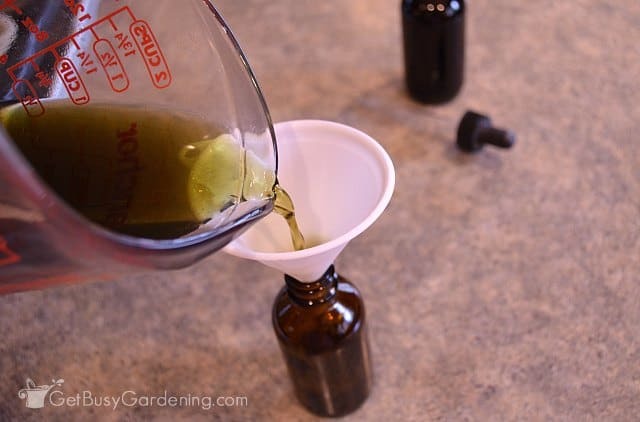 Step 7: Allow your stevia extract to cool, and then use a tiny funnel to fill your glass dropper bottles. 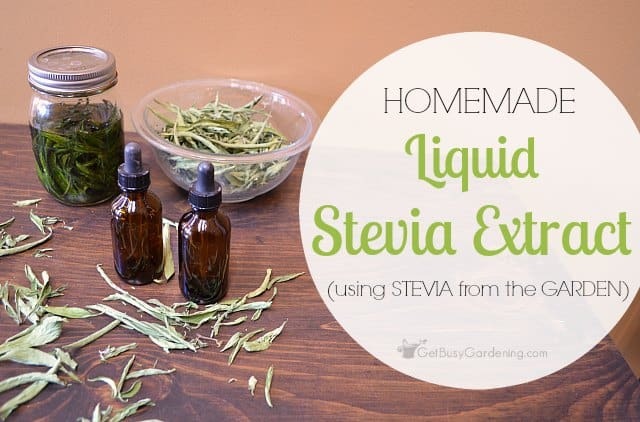 Store your homemade liquid stevia extract in the fridge to keep it fresh. If you chose to leave the alcohol infused, then you don’t need to refrigerate it because the alcohol will preserve it. If you’ve never used liquid stevia extract as a sweetener before, be careful because a little goes a long way. Liquid stevia extract packs a BIG punch. If you’re using it to sweeten your coffee, tea, or other drink, start with just one drop. If it’s not sweet enough, then add one drop at a time to taste. If you want to use stevia extract in recipes to replace sugar, I would recommend finding recipes that are written specifically for stevia, and not trying to figure out the sugar/stevia portions yourself. 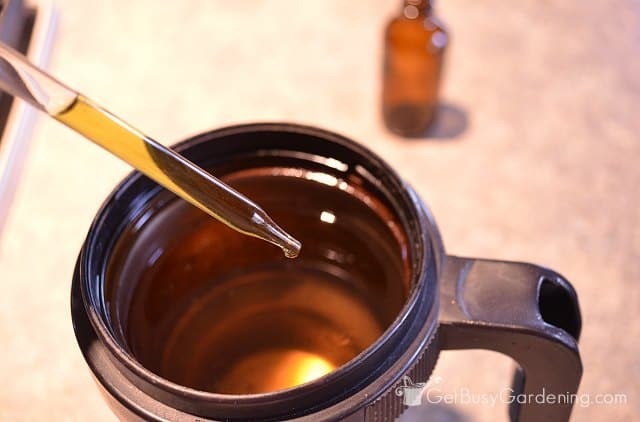 Have you ever made homemade liquid stevia extract before? Share your recipes below. Thanks for these directions! Pinning! You’re welcome! Thanks for pinning. Thanks for the great and informative information! I love Stevia, but it can be expensive, so this is a great resource for saving money on groceries too! I don’t think that you can make any type of extract without using alcohol (technically). But, you could try steeping the leaves in water rather than alcohol. It won’t last very long though since the alcohol preserves the liquid in the extract, but you can still use it for sweetener. 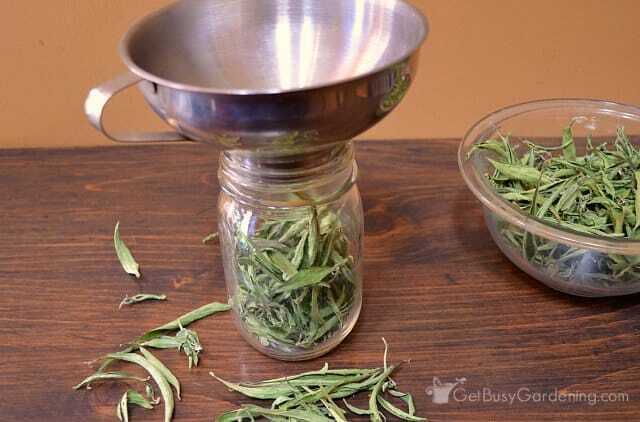 You could also dry the leaves, and add crushed stevia leaves right into your tea to sweeten it as needed. Many thanks for the instruction and illustrations. Do you have any idea about the industrial scale preparation of liquid Stevia? I mean the economic and commercial method of preparation. 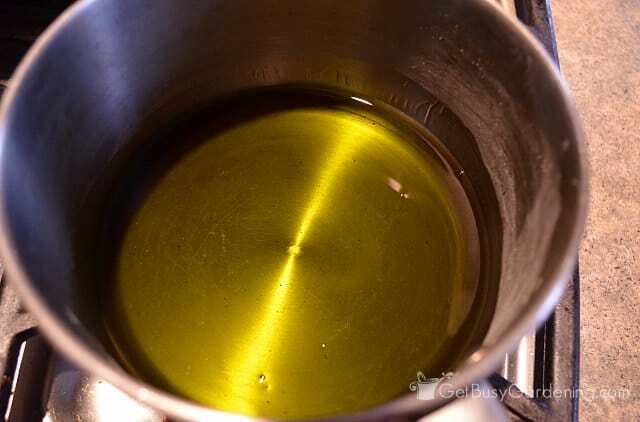 Is it necessary to purify the extract as Stevioside and Ribaudioside or the homemade preparation is fine for market?